The RP Photonics Buyer's Guide contains 23 suppliers for diffraction gratings. The software RP Resonator also works with gratings. Find out e.g. the wavelength-dependent beam path in a single-pass configuration or within a laser resonator. A diffraction grating is an optical device exploiting the phenomenon of diffraction, i.e., an kind of diffractive optics. It contains a periodic structure, which causes spatially varying optical amplitude and/or phase changes. Most common are reflection gratings, where a reflecting surface has a periodic surface relief leading to position-dependent phase changes. However, there are also transmission gratings, where transmitted light obtains position-dependent phase changes, which may also result from a surface relief. This article treats those diffraction gratings where the diffraction occurs at or near the surface. Note that there are also volume Bragg gratings, where the diffraction occurs inside the bulk material. Figure 1: The white-light output of a high-power supercontinuum source is spatially dispersed by a diffraction grating in order to demonstrate the spectral content. The beam path has been made visible with a fog machine. The photograph has been kindly provided by NKT Photonics. It is instructive to consider the spatial frequencies of the position-dependent phase changes caused by a grating. In the simplest case of a sinusoidal phase variation, there are only two non-vanishing spatial frequency components with ±2π / d, where d is the period of the grating structure. Figure 2: Output beams of all possible diffraction orders at a diffraction grating. Note that different sign conventions may be used for the diffraction order, so that there may be a minus sign in front of that term. The equations above may lead to values of sin θout with a modulus larger than 1; in that case, the corresponding diffraction order is not possible. Figure 2 shows an example, where the diffraction orders −1 to +3 are possible. Figure 3: Output angles of a reflective diffraction grating with 800 lines per millimeter as functions of the wavelength. The incident beam has fixed angle of 25° against the normal direction. Figure 3 shows in an example case of a grating with 800 lines per millimeter, how the output angles vary with wavelength. For the zero-order output (pure reflection, m = 0), the angle is constant, whereas for the other orders it varies. 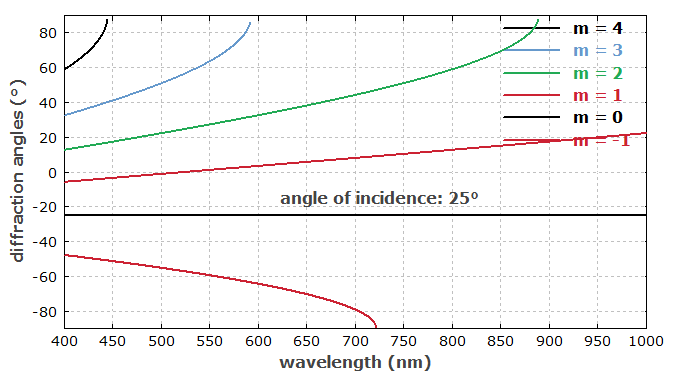 The order m = 2, for example, is possible only for wavelengths below 560 nm. 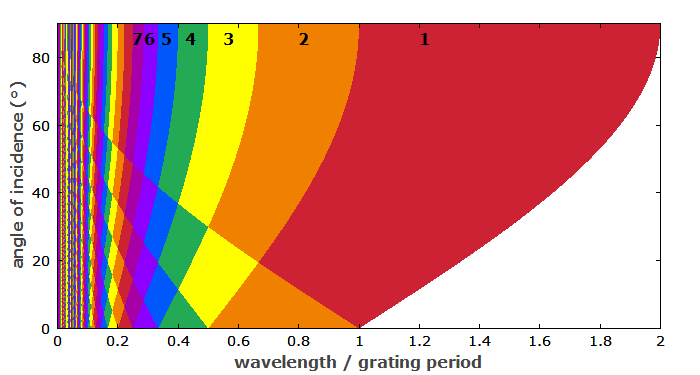 Figure 4: Color-coded number of non-zero diffraction orders as a function of the wavelength divided by the grating period. 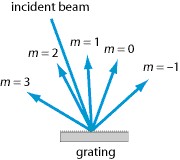 Figure 4 shows how the number of diffraction orders depends on the ratio of wavelength and grating period, and on the angle of incidence. The number of orders increases for shorter wavelengths and larger grating periods. The Littrow configuration is used, for example, when a grating acts as an end mirror of a linear laser resonator. A given grating orientation fixes a wavelength within the gain bandwidth of the laser medium for which the resonator beam path is closed, i.e., laser operation is possible. This technique is used for making wavelength-tunable lasers – for example, external-cavity diode lasers. In a grating spectrometer, for example, one exploits the wavelength-dependent beam directions after a diffraction grating. The achievable wavelength resolution depends not only on the obtained angular dispersion (e.g. in units of microradians per nanometer), but also on the natural beam divergence angle: the smaller the divergence, the more precisely one can determine a change of angle. Therefore, a high wavelength resolution requires a large illuminated spot on the grating. One can show that the relative wavelength resolution Δλ / λ is of the order of 1 / (m N) where m is the used diffraction order and N is the number of illuminated grating grooves. An important question is how the output power is distributed over the different diffraction orders. In other words, the diffraction efficiency for certain diffraction orders is of interest. This depends on the shape of the wavelength-dependent phase changes. In general, diffraction efficiencies can be calculated with diffraction theory. Diffraction gratings can be optimized such that most of the power goes into a certain diffraction order, leading to a high diffraction efficiency for that order. This optimization leads to so-called blazed gratings (echelette gratings), where the position-dependent phase change is described by a sawtooth-like function (with linear increases followed by sudden steps). The slope of the corresponding surface profile must be optimized for the given conditions in terms of input angle and wavelength. In the Littrow configuration (see above), the shape is such that the linear parts of the structure are parallel to the wavefronts of the incident light. A traditional technique is based on a ruling engine, which mechanically imprints the required surface relief (a groove structure) on a metallic surface, for example. Although ruled gratings are difficult to make with very small line spacings, they can be used for robust metallic blazed gratings with high diffraction efficiency. A disadvantage for use in grating spectrometers is that they cause substantial amounts of stray light due to surface irregularities. Holographic surface gratings are made with photolithographic techniques, which allow finer grating structures. Simple holographic gratings have a sinusoidal phase variation and thus a low diffraction efficiency, but they cause only little stray light as their surfaces can be very regular. They can be made in a wide range of hard materials such as silica and various semiconductors, and advanced fabrication techniques can produce carefully controlled structures, such as blazed gratings. Holographic volume gratings have a periodic refractive index variation within a transparent medium. They can have high diffraction efficiency and low stray light, but can be sensitive to changes of temperature and humidity. Their sensitivity to humidity may be reduced by sealing them with suitable surface layers. It is also possible to fabricate a diffraction grating on a prism; the combination of a prism and a grating is sometimes called a “grism”. One may choose the parameters such that light at a certain center wavelength gets through the grism without any deflection. Another possibility is to make a grating on top of a dielectric mirror structure, resulting in a reflecting grating mirror with very high diffraction efficiency . They are used in grating monochromators and spectrometers, where the wavelength-dependent diffraction angles are exploited. Figure 5 shows a typical setup of a monochromator. Artifacts in the obtained spectra can arise from confusion of multiple diffraction orders, particularly if wide wavelength ranges are recorded. Figure 5: Design of a Czerny–Turner monochromator. More details are given in the article on monochromators. Pairs of diffraction gratings can be used as dispersive elements without wavelength-dependent angular changes of the output. Figure 6 shows a Treacy compressor setup with four gratings, where all wavelength components are finally recombined ; it can be used for dispersive pulse compression, for example. The same function is achieved with a grating pair when the light is reflected back with a flat mirror. (Note that such a mirror may be slightly tilted such that the reflected light is slightly offset in the vertical direction and can be easily separated from the incident light.) Such grating setups are used as dispersive pulse stretchers and compressors, e.g. in the context of chirped pulse amplification. They can produce much larger amounts of chromatic dispersion than prism pairs, for example. Figure 6: A four-grating setup, consisting of two grating pairs. Grating 1 separates the input according to wavelengths (with passes for two different wavelengths shown in the figure), and after grating 2 these components are parallel. Gratings 3 and 4 recombine the different components. The overall path length is wavelength-dependent, and therefore the grating setup creates a substantial amount of chromatic dispersion, which may be used for dispersion compensation, for example. As described above, diffraction gratings (often in Littrow configuration) are often used for wavelength tuning of lasers. 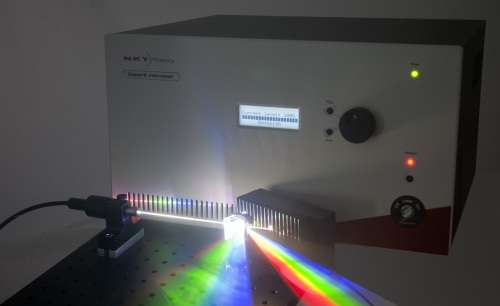 In spectral beam combining, one often uses a diffraction grating to combine radiation from various emitters at slightly different wavelengths into a single beam.